Joan brings us this beauty, via Dailymail. Behold this newly discovered species of wasp, found on the Indonesian island of Sulawesi. 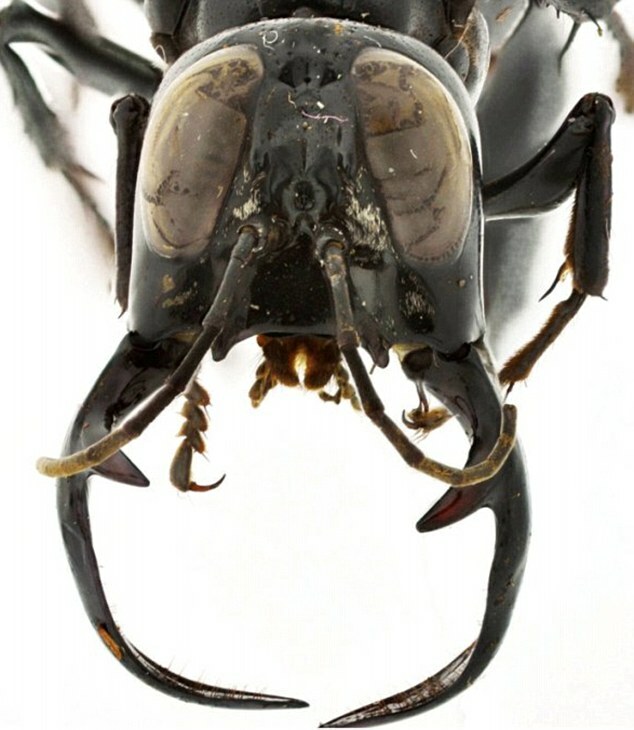 This two-and-a-half inch monster has mandibles so large that when closed they wrap around its head. When opened, they are larger than its front legs. 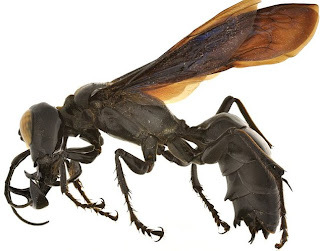 This specimen is a male warrior, which Lynn Kimsey, professor of entomology at the University of California, Davis, describes as the komodo dragon of wasps. What good are those mandibles for? Well, the obvious answer is that they would be good in defending the nest, as all good warrior wasps do. But they also aid in reproduction. Those mandibles wrap around a female wasp's thorax perfectly to hold her in place while they do their business. How handy would it be if I, a self-styled warrior human (by virtue of the fact that I have a nest to defend and there are no other of-age males available to fulfill the role) came equipped with such mandibles? I wouldn't have need of my blunderbuss, moat, and hounds to ward off invaders. Alas, I don't think my wife would be impressed by the mandibles. which says "this species has never been observed alive." And all I could think was THANK GOODNESS. The ugliest baby bird in the world?